This recipe has all of the flavours of a Monte Cristo sandwich in a crisp green salad! 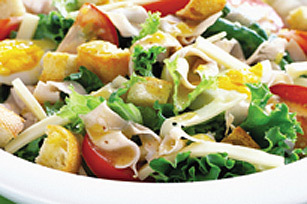 Made with lettuce, tomatoes, croutons, turkey, Swiss cheese and eggs, this salad is anything but ordinary. Toss greens with tomatoes and croutons in large serving bowl. Excellent source of vitamin A & calcium, good source of vitamin C & iron, moderate dietary fibre!